I could not have stumbled upon it at a better time. I was on the first sabbatical. My goal was to meditate on the purpose of music in worship and reflect on how it serves the liturgy. Smith does address music explicitly in chapter 5, but he spends more time arguing that we are “liturgical animals (Smith 123).” This comes from his critique of modern philosophical anthropologies, which is just a fancy way of saying “what we understand mankind to be.” Our education, Christian and otherwise, seeks to fill our minds with information; this assumes that we are primarily “thinking things (Smith 42).” Meanwhile, the “secular” liturgies of our culture (advertising, film, shopping, etc.) subvert this information and stealthily conditions our desires. He begins by defining a more holistic anthropology that acknowledges the power of rituals and practices. By citing what he calls “cultural liturgies,” Smith demonstrates how our vision of the good life is shaped (Smith 58). A trip to the mall, for example, shapes our understanding of what our lives ought to look like. It is often argued among churchgoers that it doesn’t matter how you worship God, as long as you worship him. That is to say that practice does not matter; the heart is what matters most. Yet, it is with the heart that we struggle the most. Smith’s point is that the heart must be oriented. If it is not oriented toward God and his kingdom, it is oriented elsewhere. Practice, ritual, and liturgy orient our hearts to desire and love God. We can fill our minds with the truths of Scripture all day long but if our worship does not orient our hearts toward God’s kingdom, we will lose them to the “good life” that our cultural liturgies paint for us. This is why Desiring the Kingdom has affected me as a music minister. I have long felt like our little worship team is up against a lot. How could a few untrained musicians in a little church with little resources and no sound system possibly compete with the live music alternatives the culture has to offer (or the mega-church down the road for that matter)? How can a screen-less sanctuary with old fashioned stained glass windows compete with the technological utopia in our homes? While I have some questions about James Smith’s assumptions on the degree to which liturgy orients our hearts, that liturgy shapes our desires is helpful. Since reading Desiring the Kingdom I have put some thought into how music in the liturgy might affect our desires. The words we sing, obviously, are important, but not because we need more information. That is what preaching is for. That is what the public reading of Scripture and the Creed are for. The words we sing must be true, but they need to be more than true. They need to be poetic. In a reaction against emotionalism in the church, I have defaulted to a minimalistic, even pragmatic approach to music in worship. This was good for a season because it forced me to locate a proper place for it within the liturgy: worship became much more than music. However, since my sabbatical, and encouraged by Desiring the Kingdom, I have been considering the poetic and aesthetic qualities music bring to worship. 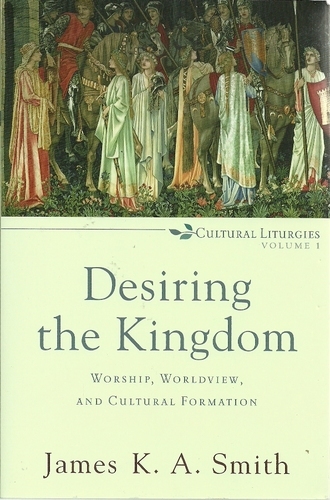 Desiring the Kingdom is the first installment of Smith’s Cultural Liturgies series. For a somewhat lengthy explanation of the book by Smith himself, check this lecture out. Volume 2, Imagining the Kingdom, has already been published as well. Smith, James K. A. Desiring the Kingdom: Worship, Worldview, and Cultural Formation. Grand Rapids: Baker Academic, 2009.